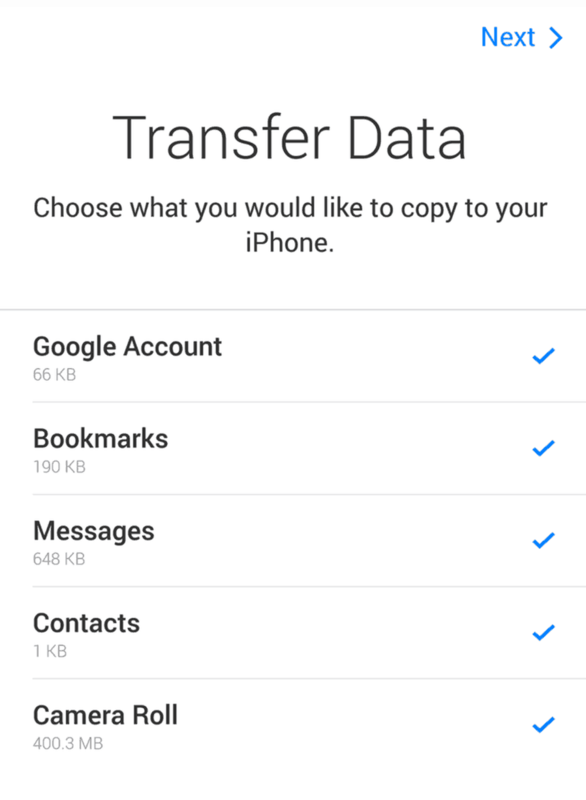 How to transfer data from Android to iPhone and iPad? In case that you’ve just got your hands on a new iPhone or an iPad you must be wondering how to transfer all of your contacts, videos, photos, music and other valuable data from your old Android device to the iOS device. Luckily, there is a special app, called “Move to iOS”, which can make your life a lot easier and help you switch to the new device and move all of your information without hustle. You can find it for free from the Google store and, on this page, we will show you how to use it. “Move to iOS” app is an Apple’s creation, which connects your old Android tablet or mobile and your iPhone or iPad with a direct Wi-Fi connection that transfers over all the data that you want. Currently the app works with iOS9 or higher versions, so if you are with the newest iPhone XS or XS Max, you will have no issues. Keep in mind though, that your Android apps are not compatible with iOS, thus, they cannot be transferred, nor any music or passwords of existing accounts. While setting up your new iPhone or iPad device, reach to the “Apps & Data” screen. 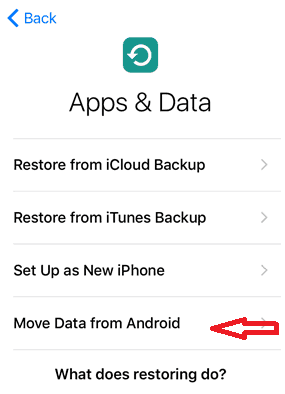 Select the “Move Data from Android” option. 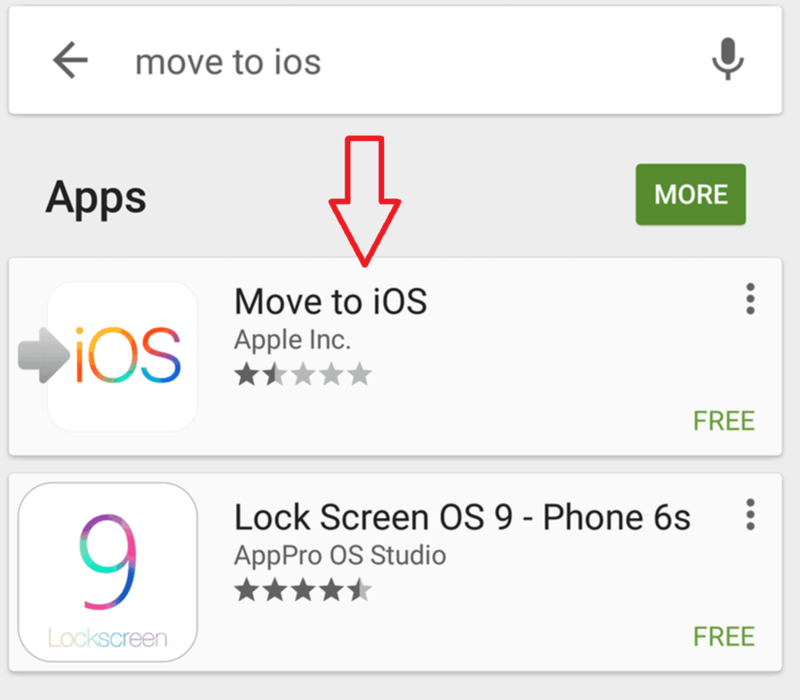 Next, go back to your Android phone or tablet, open the Google Play Store and search for Move to iOS app. Install the app and then tab open when it’s ready. Next, on the Android device read the terms and conditions, click “Agree”and then “Next”. On your iOS device click “Continue” when move from android screen appears. Then wait for a code to get displayed on the iPhone or iPad and enter it to your Android device. Next, the Android device will connect via peer-to-peer Wi-Fi with your iPhone or iPad and will ask you what data to transfer. Select everything that you want to move over. Note: The transfer process may take some time, depending on the size of the data that you are moving. When the transfer process completes, tap on Continue Setting Up iPhone or Continue Setting Up iPad and carry on setting up your Apple ID. 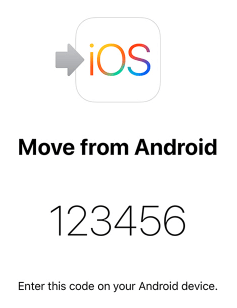 Once the iOS setup process finishes, you’ll be prompted to log in to the accounts you transferred from your old Android device. Google has also developed several apps, which can help you with the switch to your iPhone or iPad if you want to transfer certain types of data separately. For instance, you can use Google Docs for files, Google Photos for syncing your pics on the new iOS device, Google Drive for large files, Google Play Music for music files, Google Calendar, so you can stay up to your schedule on the new device. Another easy way to transfer your contacts is to use the CardDAV protocol, accessible from your Google account, which Google uses to sync contacts between devices and is also supported by iPhone.